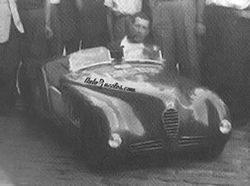 Luigi Fiertler, born in Cosenza (1909-1970), was a unique character in the sports car scene of the fifties. He had the ability to engage with his family, with almost inexhaustible energy, worked dealer's how to workshops for car manufacturer Alfa Romeo and how to prepare a sports car. During the war, while stationed at the airport in Reggio Calabria as an airman, he even managed to build replacement parts then unavailable. The Lupetta was a masterpiece, a jewel of design and technology: a small low spider, close to the ground, aggressive enough to encourage sporty driving, forerunner of the current minicar. Passion for whole nights devoted to the preparation of sports cars which participated in the racing, the Mille Miglia, the Giro di Calabria, the Giro di Sicilia and hillclimbs with an impressive top speed of 65 mph.